Uses: Inflammatory bowel disease. Ailments associated with leaky gut syndrome (increased intestinal permeability). Gastritis. Gastroesophageal reflux disease (GORD). Assists in treating constipation. 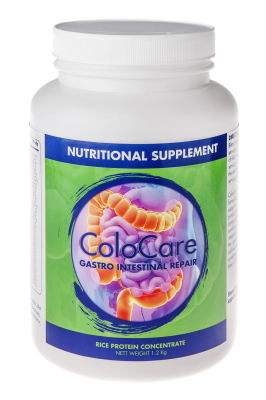 ColoCare is a nutritional food formulated to supply specialized support to the digestive system to facilitate Gastro Intestinal Repair. Treating the gastrointestinal tract (GIT) in a food based vitamin and nutrient rich form to treat the multitude of health complaints associated with poor digestion, absorption and GIT immune system function at the root cause, the gut. The formulation supports intestinal mucosal health and repair to regulate permeability, and promotes the growth of healthy bacteria to address the symptoms leading to leaky gut syndrome. The rice protein concentrate base of ColoCare is a low allergenic food to eliminate colon associated food sensitivity reactions and sooth colonic irritation. 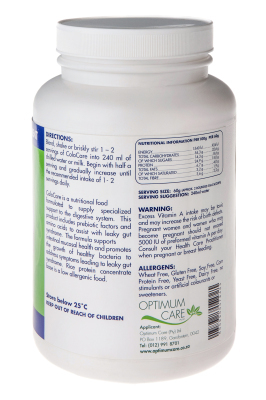 This product includes prebiotic factors and amino acids, vitamins and minerals to assists with leaky gut syndrome. Medium chain triglyceride oil (MCT oil) and L-glutamine act directly on healing the intestinal wall. Inulin is a prebiotic working to feed the vital healthy gut bacteria. These factors work together to support optimal digestive health.